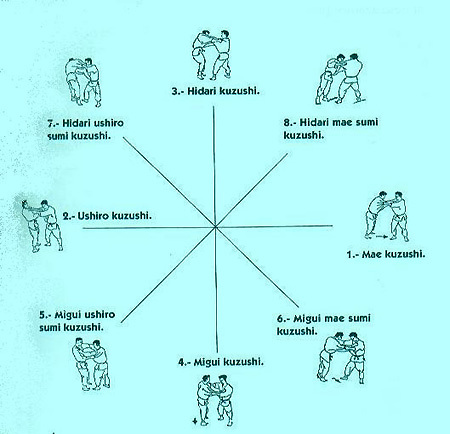 JUDO: THE PHASES OF A THROW. Breaking the balance of the opponent by pull or push movements of the arm(s) is the most essential part of a throw. The aim is to set up the opponent for the intended throw. The direction of strength (pull, push, levy, press) must be coordinated on the intended following throw technique. Roppo no Kuzushi; the six directions of breaking balance, referring to the right, left, right front corner, left front corner, right back corner, and left back corner. Happo no Kuzushi; Same as above, but the directions directly forward and back are added, for a total of eight directions of off balance. TSUKURI: positioning for the throw. The body is moved into the most favorable possible position that permits the leverage of the particular technique to be effective; i.e. from which by the arms (statically), the torso and the legs the maximal strength for the actual throw can be applied. In the torso we see stabilizing contraction during lift- and-block and flexion-rotation movements. In the legs especially stretch movements play an important role in tilting. The action must be executed rapidly, because otherwise the opponent can “repair” its balance. The time which lies between breaking balance and the actual throw must be as short as possible. The body of the thrower must move into a position. The specific action of the throw, the essential part of the movement. This movement has to be as fast and as explosive as possible; the stretching of the legs is very important. There are also some other leg movements, such as swings (harai), sweeping (barai) and hooks (gari) movements. In throw techniques one uses of the lever principle. An explosive movement of the arm(s) to complete successfully the throw and to add extra speed.